Zombie Outbreak Simulator is Out! Australia, November 21st: Flash game developer, Binary Space releases “Zombie Outbreak Simulator” (ZOS), a sandbox application running on Google Maps®. ZOS allows players to unleash waves of zombies on the unsuspecting people of Washington DC. 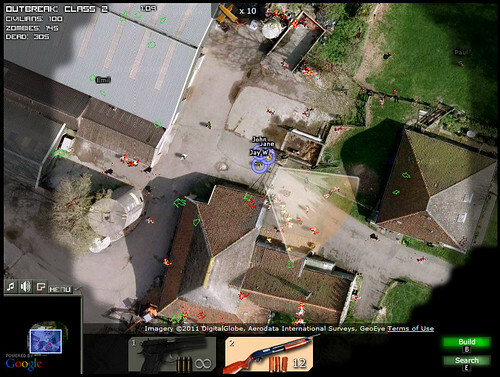 Players can tweak a number of zombie and infection variables such as zombie speed, infection rate, number of civilians and shooting accuracy to create their own version of a zombie outbreak. Watch as up to 15,000 civilians are chased down, attacked and infected by hundreds or thousands of shambling (or terrifyingly fast!) zombies over a 1km square area. Zombie Outbreak Simulator is Binary Space’s “teaser app” for their upcoming zombie RTS, “Class 3 Outbreak”, which also runs on Google Maps. Game designer, Jay Weston says, “ZOS and Class 3 Outbreak are by far the most ambitious games to be released on Google Maps, we can’t wait to see what the reaction is like. A large scale zombie infection has never been simulated like this before.” Programmer, Saxon Druce has coded each of the 15,000 map inhabitants to behave individually and interact with terrain on Google Maps, meaning that characters move under trees, around walls and into buildings, all while running at 30+ frames per second on very average PCs. More details about ZOS and Class 3 Outbreak can be found on the Binary Space (www.www.binaryspacegames.com) and Class 3 Outbreak (www.class3outbreak.com) websites.